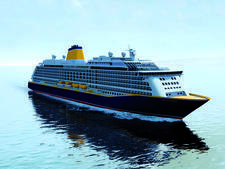 Saga Cruises Spirit of Discovery will make its debut on July 5, 2019, at a naming ceremony in Dover, followed five days later with a round-Britain cruise departing Dover. It is the first of the line's two new-builds. 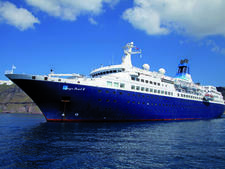 The second, a sister ship called Spirit of Adventure, launches in August 2020. From November 2019 the ship will operate all-inclusive, including drinks, Wi-Fi, gratuities, specialty restaurants, plus -- uniquely -- transfer to the cruise port for passengers who live within 250 miles of the ship. The 999-passenger ship is being built at the Meyer-Werft shipyard in Pappenburg, Germany, marking the first new-build vessel for the over-50 travel specialist and the first ship since P&O Cruises' Britannia (2015) to be built specifically for the UK market. Saga has employed design company SMC Design, which has extensive experience with cruise ship design, having worked on P&O Cruises' popular Indian restaurant Sindhu, Norwegian Cruise Line's Mandara Spa, Viking Cruises' Explorers' Lounge and many other restaurants and bars on ships. The ship will have 540 all-balcony cabins and suites, 109 of which will be specifically designed for solo passengers. The ship will be fully all-inclusive from 2020, including insurance and door-to-door travel to and from the UK departure point. There are eight different suite and cabin types, each of them with a balcony. Solo Cabins: There are four different types of single cabins -- standard, superior, deluxe and even a suite. The bulk of the cabins will be standard twins, which come in at a generous 245 square feet. One grade up, you'll find the roomier (and higher on the ship) twin deluxe. Suites: There will be three different types -- aft, forward and mid-ship. The mid-ship option offers a staggering 730 square feet of space with separate living, dining and sleeping areas. In a nod to BBC Radio 4’s British Isles Shipping Forecast, eight suites will be named after the areas: Bailey, Fair Isle, FitzRoy, Hebrides, Humber, Lundy, Thames and Trafalgar. Honouring the line's own heritage, the ship's four top suites are inspired by names connected to the company, including The Sidney De Haan Suite, named after the company founder; The Joseph Meyer Suite is named after the German shipyard founder; while Saga Rose Suite and Saga Ruby Suite are named after the line's first two ships. There will be a total of five restaurants onboard, including The Grand Dining Room, a double-height space with colonnades and chandeliers. As well as serving breakfast, lunch and dinner, afternoon tea will also be served there. The Club by Jools Holland: Saga will debut a 1950s-style supper club concept, featuring a partnership with one of the country's most popular entertainers and musicians, Jools Holland, who will also be playing live on selected cruises. The Grill (and the Verandah): With separate spaces to eat both inside and out, the Verandah and Grill will be two restaurants in one. There will be a buffet at lunchtime and, in the evening, waiter service from the centrepiece, a show kitchen. East to West: This popular restaurant onboard Saga's other ships offers an Asian-fusion menu of Chinese, Thai, Indian and Sri Lankan. Coast to Coast: In a first for Saga, Spirit of Discovery will also have its very own seafood restaurant, serving British and locally sourced fish, shellfish and other fruits de mer. Britannia Lounge: During the day, it's a venue for relaxing or hearing talks from guest speakers. At night, it comes alive with dancing and live performances. There will be two sets of entertainment each evening across various genres that include singers, musicians and lecturers. The Living Room: The 'hub' of the ship will be the bright and inviting Living Room. This vibrant, sociable venue will be the place to meet friends, grab a coffee, go shopping or relax with an after-dinner cocktail. Open day and night, it will serve gelato, fresh pastries and homemade cakes before turning into a Champagne bar, open until late. The Playhouse: Another first for Saga, this theatre space fits more than 400, and performances come from the ship's own theatre company. Guest entertainers and cinema screenings will also be featured. Popular on the other Saga ships, The Library has the feel of a cosy coffee shop, with an extensive selection of fiction and reference books. There is also an open kitchen area with complimentary tea, coffee and cake. The Lido: The ship's outdoor pool area will include two hot tubs and plenty of lounges. The Spa: The Spa will have a hydrotherapy pool, a steam room, infrared sauna and five private areas for treatments. It will be adjacent to a gym with Pilates, yoga, tai chi classes, and one-to-one sessions with fully-trained fitness experts. 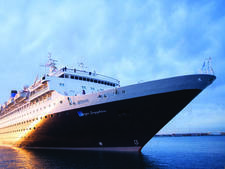 After an inaugural cruise around the British Isles, the ship will spend its time in the Baltic, the Norwegian fjords, the Mediterranean and the Atlantic Islands.